QMobile Feature Phone Q3310 Update: Seems like QMobile is trying to give Nokia a tough time in Pakistani mobile market. The new Q3310 feature phone by QMobile is clearly inspired by the legendary Nokia 3310 phone in more ways than one. If you don’t remember, Nokia is coming to Pakistan soon and is relaunching the 3310 which is one of its most famous phones ever. In light of this, QMobile is hoping to that it can attract some early buyers with its affordable price tag – Rs. 1,999 for the Q3310 vs Rs. 5,500 for the new Nokia 3310. 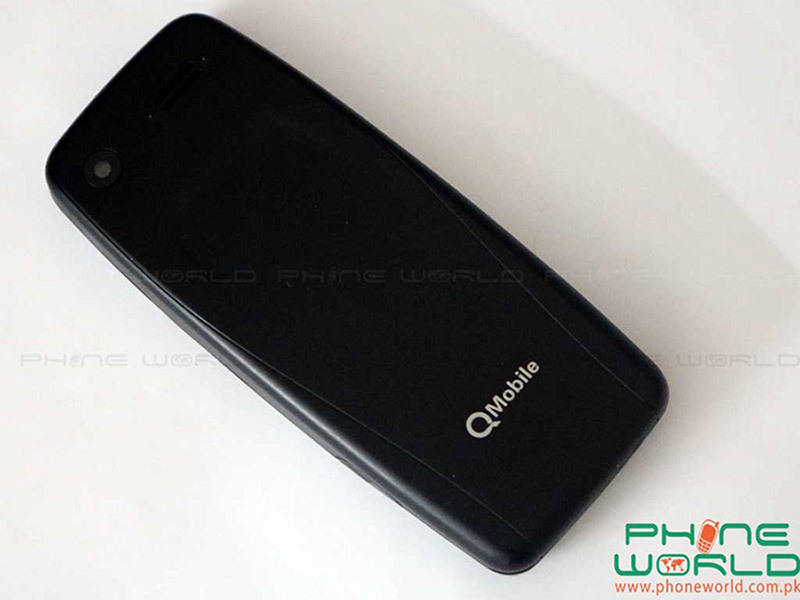 While most specs of QMobile Feature Phone Q3310 are similar, one area where QMobile’s offering has an advantage is the battery. Nokia 3310 features a ‘tiny’ 1,200 mAh battery compared to the monstrous 3,000 mAh battery in the Q3310. The other features are mostly the same with a 2.4 inch LCD screen, a primary VGA camera (without a flash, unlike the 3310) and a dedicated torch. 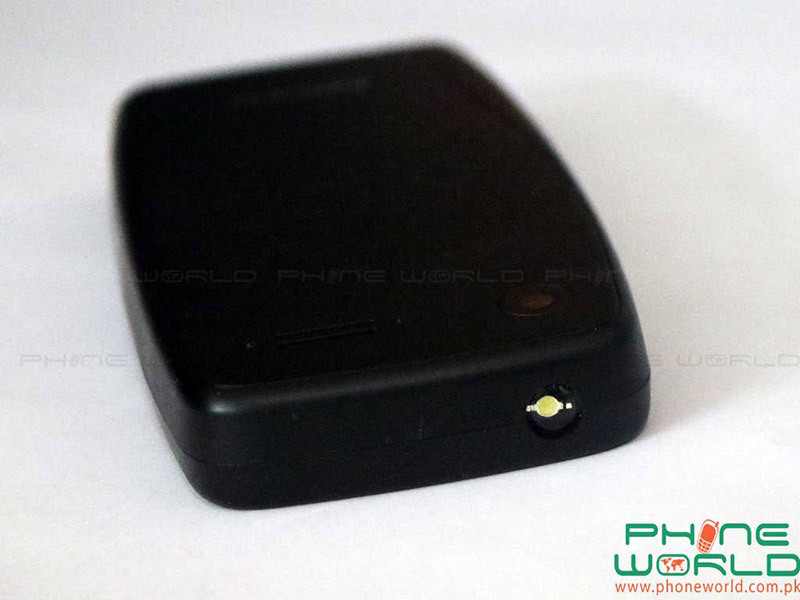 The Nokia phone comes with an LED flash which can double up as a flashlight. 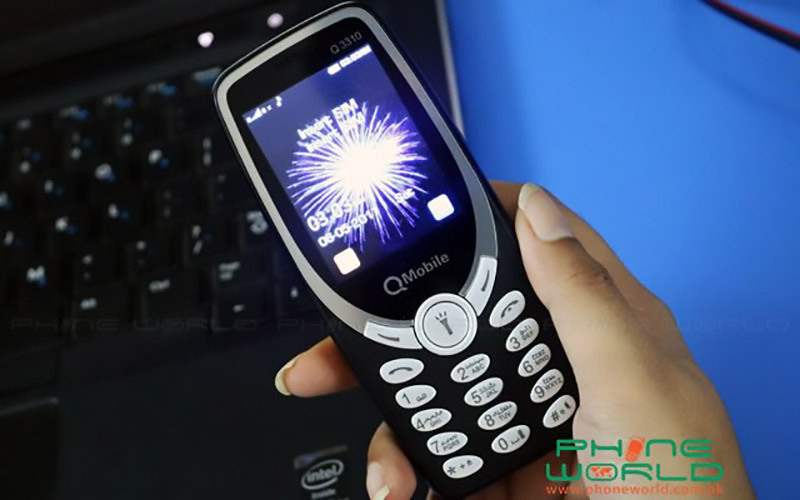 Other features of QMobile Feature Phone Q3310 include a powerful speaker, an FM radio and microSD card slot which supports up to 32 GB of expandable memory. The phone comes with a headphone jack included as well. 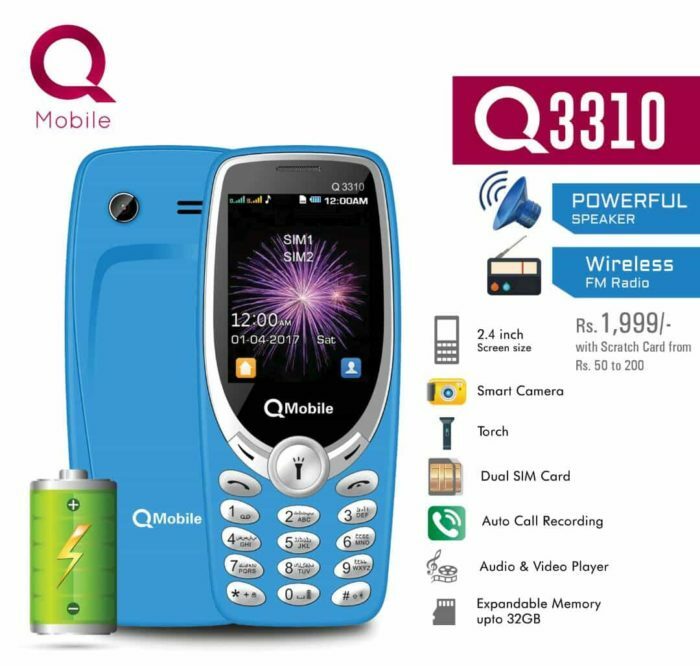 The QMobile Feature Phone Q3310 is a dual SIM phone and will be available in Blue, Black, Silver, Red colors. This is also similar to the Nokia’s new 3310 which is also available in several bright colors (red, bright yellow, dark blue). QMobile may have an edge on the Nokia phone in terms of price as well. While the prices for Pakistan aren’t confirmed, the new Nokia 3310 costs Rs. 5,500 in Western markets, twice as much as QMobile Q3310 which goes for Rs. 1,999. 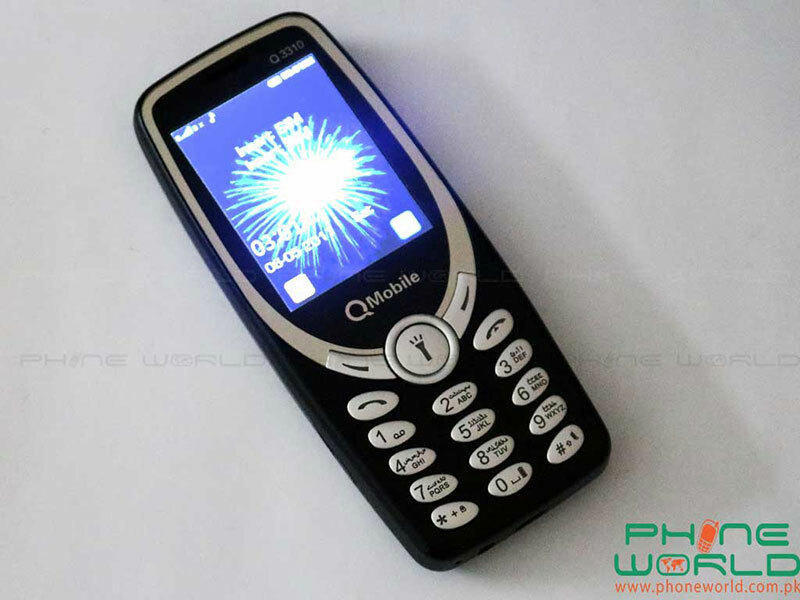 Does the QMobile Q3310 stand up to the Nokia 3310 in terms of durability? Only time will tell. 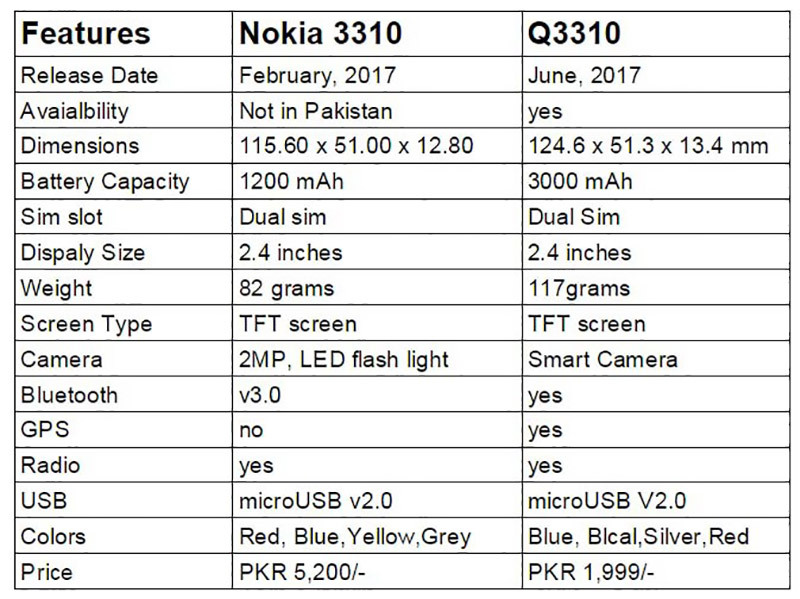 Q3310 is a competitor of legendary phone Nokia 3310(2017) but QMobile has improved some features in Q3310. Q3310 has bigger battery than Nokia device and users look for big battery phone in feature phones category. 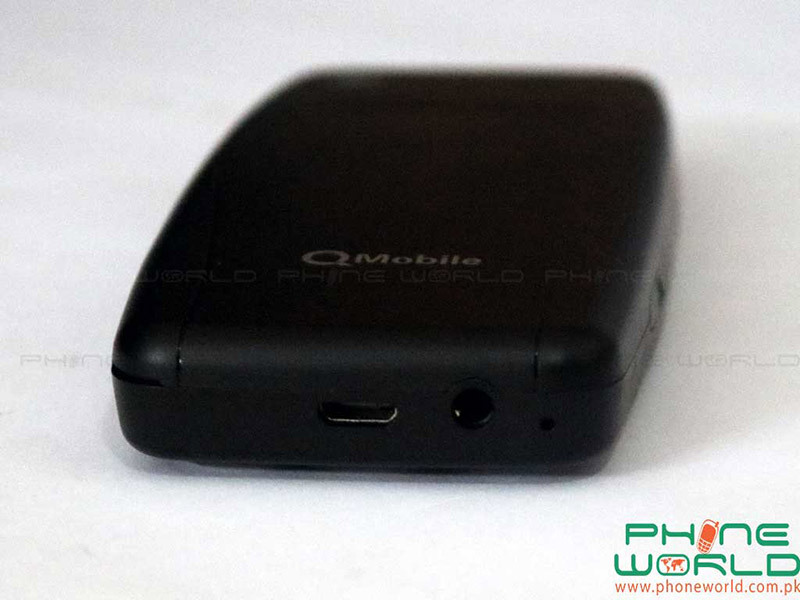 QMobile can attract market towards Q3310 because of its bigger battery feature.